“The Life of Saint Mary of Egypt” fits in a genre known as monastic literature. It is not history. It is neither the style of modern history we are used to (Henry Chadwick or John Julius Norwich would not narrate the facts of Mary’s life this way) nor the kind Josephus or Eusebius wrote. It is certainly not a news story or an affidavit. It is a story written by a monastic for other monastics. 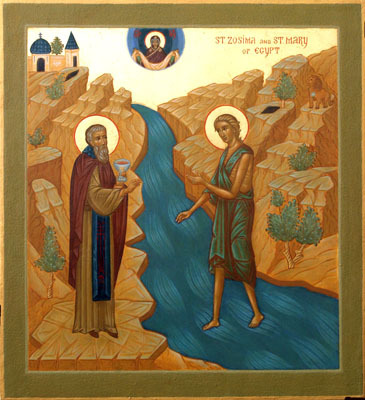 For Christian monasticism, the origins of monastic literature grow out of the famous Sayings of the Desert Fathers and Mothers. Other early monastic literature includes the writings of Evagrius of Pontus, Saints Jerome, Basil, and John Cassian. Refrain: Have mercy on me, O God; have mercy on me. O savior, I am the coin marked with the king’s likeness, which you lost of old. But light your lamp, your Forerunner, O Word, and seek and find again your image. Refrain: Holy Mother Mary, pray to God for us. Your soul on fire, O Mary, you ever shed streams of tears, to quench the burning of the passions. Grant the grace of these, your tears, also to me, your servant. My soul, O my soul! Rise up! How long will you sleep? The end draws near and anguish will soon overwhelm you. Rouse yourself, then; watch and be ready, that you may win mercy from Christ, who is everywhere present and fills all things. The story is read in two parts: First, the character of Zosimus is introduced. Shortly after he first encounters Mary, the narration is paused while the service proceeds. When the narration resumes, Mary tells her own story. All of the important elements of this story appear in earlier monastic literature. Prior to Sophronius, at least three other versions of the story exist. The earliest version comes to us via Cyril of Scythopolis, who tells the tale of a young Maria in his Life of Saint Cyriacus. Cyril’s Maria is a canoness or a psaltria in the Church of the Resurrection in Jerusalem who flees to the desert to avoid scandal. Efthalia Makris Walsh writes of this Maria, “[F]earing that she might be found responsible for the devil’s ensnarement, through her, of many men, [she] left Jerusalem and lived for many years in a cave.” The translation in Benedicta Ward, however, paints a slightly graver picture: “[B]y the fault of the devil I became an object of scandal to many. Fearing that, although I had already done penance for the cause of the scandal, I would add sin to sin (Eccl 3.29) I prayed to God that He would remove the cause of the scandal.” In this version, Maria has performed a penance for causing scandal, which may indicate her complicity in it, though not necessarily. Walsh notes that Roman law under Justinian provided that a deaconess who was assaulted against her will (i.e., she was innocent) was still to be sent to a monastery for several years. The Maria in Cyril’s tale may not be a deaconess, but as an ecclesiastical singer, she is an ecclesiastical functionary and some similar discipline may have been at work. Yet another version lengthens considerably the tale which Cyril and Moschus relate. Benedicta Ward provides a translation of an anonymous vita included in the Bibliotheca Hagiographica Graeca. In this account, the nun (a “consecrated virgin living in the Holy Sepulchre”) has progressed from being an innocent source of temptation to being complicit in an affair with a monk. Upon coming to the monk’s cell and being ignored, compunction pierces her conscience when she hears him (rather conspicuously) bewailing his sins and begging God for mercy. Spurred by his repentance, she flees to the desert to do the same. Flees into the Palestinian desert beyond the Jordan. A wandering monk or monks serendipitously finds her and learns her story. The monk(s) are dismissed and asked to return, at which time they discover that she has reposed in the Lord. The story begins with the desert amma being mistaken for a man. One other antecedent story deserves explicit notice: Saint Jerome’s “Life of Paul the Hermit.” Sophronius’ story shares so much in common with Jerome’s life of Paul, that it must be said that Sophronius uses Jerome’s narrative as a model for his own. Sophronius magnifies the basic elements of these stories into a gripping and majestic story. If you have not read it, do so now. (I recommend Maria Kouli’s translation, to which she provides an excellent introduction.) Tomorrow, I begin to analyze why Zosimus takes up so much of Sophronius’ story. The reason may surprise you.